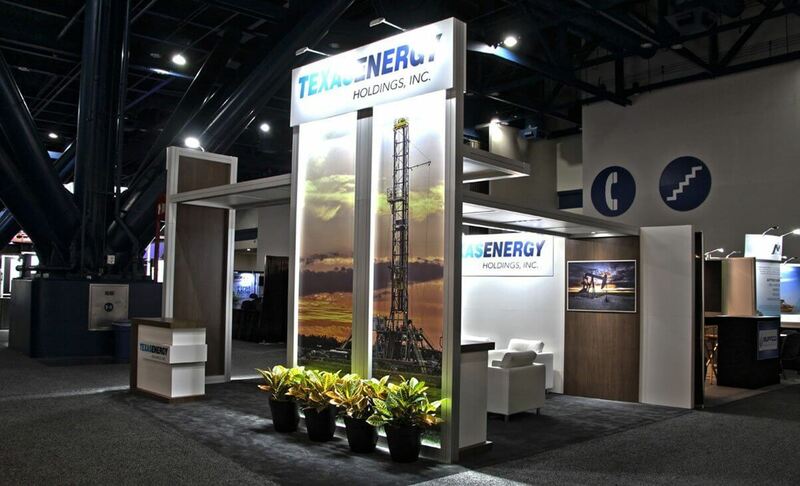 Texas Energy Holdings, Inc. came to Exhibit Network with precise requirements for their 20×20 peninsula booth: to have a large presence without the expense of an overhead hanging sign, to have a modern architectural look, compelling graphics, greeting area and seating area, and to have the ability to convert this booth to an island configuration in the future. Exhibit Network designed and fabricated this custom exhibit, fulfilling all the requirements and then some. The debut of this booth turned heads for its sleek modern look and it accomplished what the exhibitors intended for it. It was also made to be adaptable for future enhancements. There are two graphic panels on the interior back wall which can be changed out for monitors. The exterior back wall of the peninsula can be clad with graphics or additional messaging for use in an island configuration.